Computex is underway in Taiwan this week and the show is one of the largest electronics and computer trade shows in the industry. There will be all sorts of computer gear and other devices like tablets unveiled at the show. 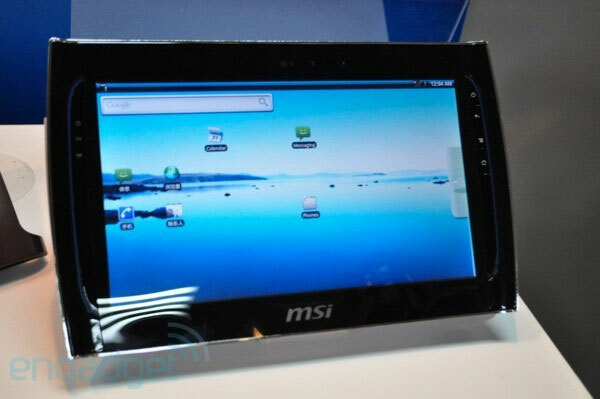 MSI has unveiled a pair of new prototype tablets for the first time. The WindPad 100 grabbed some time at the MSI press conference and sports an Intel Atom CPU. The CPU is the Z530 and the machine runs Windows 7 with a custom UI over the top. It has a 10-inch capacitive touchscreen and price is said to be in the $499 range when it launches later this year. The more interesting of the two tablets is the WindPad 110. This machine wasn’t in the press conference, but is in the booth at the show. It sports NVIDIA Tegra 2 power and runs Android OS. The tablet has the same 10-inch touchscreen and will sell for $399, if it makes it to market at the end of the year. I bet it will make it, Android tablets are likely to be more popular than Windows one. Have a look and our article on Android vs iPhone to see which smartphone and mobile platform is best for you.